My name is chelsea stark i'm a Visually Impaired photographer. I saw your post on Blind & Vision Impaired Friends Facebook group. And decided to take a look at the link that you posted. I particularly enjoyed your post titled New way to Vacation. I think your Post Wood be great for my latest project. I have created a blog called Blind all around the world. 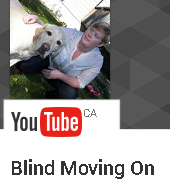 This blog is a group of blind or visually impaired people. Who want to share about their life experiences as a blind or visually impaired person. We would like to inspire more blind and visually impaired people to talk about their lives and their experiences. If you would like to be a part of this blog. Please send me a message using the contact form on the blog.